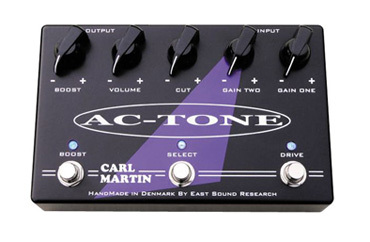 AC-Tone is the next overdrive in the British voiced vein, as the PlexiTone it is a three in one pedal. The AC-Tone offers two channels of overdrive, voiced alike for preset usage, on top of that it gives you an up to 20dB clean boost channel. The overdrive is low to medium gained for a sweet and crispy with the mellow midrange that reminds one of the old TopBoost amps from the late 60's , the two channels are ranging from a mild breakup to a healthy overdriven sound. One channel can be used for that slightly chimey breakup, and the other channel can be set for more overdrive giving more saturated mids and drive, you can freely set them the way that suits your needs.